Designation: Department of political sciences, La Sagesse University. Copyright: © 2018 Zreik M. This is an open-access article distributed under the terms of the Creative Commons Attribution License, which permits unrestricted use, distribution, and reproduction in any medium, provided the original author and source are credited. In the Sino-Indian relations it is difficult to have a full integration. China occupies territory claimed by India, India occupies territory claimed by China, and both nations compete for access to scarce water and energy resources. China is a giant in the world of commerce and is trying to dominate the world through its economic power, while India that is still in a lower economic rank is following the China’s way of development. Both of India and China are looking into the land of Sri Lanka as a future economic destination, this country that is considered as the South Asian pearl. In this paper information will be provided about Sri Lanka, China and India. Then the issue of the Sino-Indian conflict will be tackled by giving some historic facts and details about the conflict, and how India lost the race with China. Also detailed information will be provided on how India and China are trying to build relations with Sri Lanka and how the future of Sino-Indian relations will be shaped. Sino-Indian conflict, Sri Lanka, economy, peace building, integration. The world is divided into continents and each continent is divided into regions. This paper will shed the light on the regions of Southern Asia and Eastern Asia. Asia is a continent of ancient civilization; some empires existed in the Asian region, such as: Ancient India, Medieval India, Ancient China, Imperial China and Japanese Civilization. As we can see, both India and China had a great history of culture and civilization, and they are still strong nations in terms of politics, economy, culture and military power [1-3]. India the South Asian country and China the East Asian country, China that has risen economically and India that is rising, these two countries are not similar or identical, they witnessed a history of conflict and they have a lot of problems that divide them, a good example is the Sino-Indian border conflict that occurred in 1962 . In such a situation that is similar to a cold war between India and China, and in the context of economic race, both countries are trying to spread their wings economically in the world and one of the countries that they are trying to reach is Sri Lanka (the South Asian country and Indian’s neighbor), because China is an economic giant in Asia, it was able to reach the Sri Lankan market and build a strong bilateral relations, also India is trying to build a strong bilateral relations with Sri Lanka and open up to the Sri Lankan market . In such situation, two huge Asian countries are trying to build strong relations with Sri Lanka for their own benefits. Sri Lanka the neutral and peaceful country will not miss the opportunity of building a strong relation with China (the economic giant) and will not enter in a state of enmity with India (the neighbor) . But, will Sri Lanka play the role that superpowers and huge countries failed in it? Will Sri Lanka be a peacemaker? Will Sri Lanka be the link between the two huge Asian countries (India and China)? Will the Sri Lankan intervention lead into phase of Asian cooperation and witness a unified Sino-India political and economic unit through economic cooperation? [2-8]. Sri Lanka or the Democratic Socialist Republic of Sri Lanka, it means the “resplendent island” in Sanskrit; the pearl of South Asia, this amazing island in the Indian Ocean, is being a destination for the people from the entire world to make tourism and for huge companies to invest and for some countries such as: India and China to make business . Sri Lanka is a very rich and wealthy country in its natural resources, climate and labor power; but the main problem is in its economy because of the debts and the bad economic policy. For that, Sri Lanka is accepting the offers of cooperation in business and a lot of businessmen and countries are investing in Sri Lanka. People’s Republic of China is in Eastern Asia, bordering the East China Sea, Korea Bay, Yellow Sea, and South China Sea, between North Korea and Vietnam. China is considered a communist state and Beijing is its capital and is divided into 23 provinces, 5 autonomous regions, and 4 municipalities (Figure 1) [10-11]. China seen leading economic power. 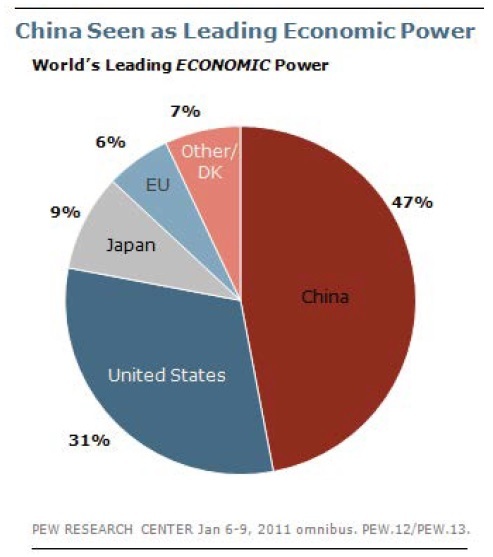 Figure 1: China seen leading economic power. The earliest recorded human settlements in what is today called China were discovered in the Huang He basin and date from about 5000 B.C. ; During the Shang dynasty (1500–1000 B.C.). It was following this initial flourishing of civilization, in a period known as the Chou dynasty (1122–249 B.C.). The feudal states, often at war with one another, were first united under Emperor Ch’in Shih Huang Ti, during whose reign (246–210 B.C.) work was begun on the Great Wall of China, a monumental bulwark against invasion from the West. Although the Great Wall symbolized China’s desire to protect itself from the outside world, under the Han dynasty (206 B.C.–A.D. 220), the civilization conducted extensive commercial trading with the West . In the T’ang dynasty (618–907)—often called the golden age of Chinese history—painting, sculpture, and poetry flourished, and woodblock printing, which enabled the mass production of books, made its earliest known appearance. The Mings, last of the native rulers (1368–1644), overthrew the Mongol, or Yuan, dynasty (1271–1368) established by Kublai Khan. The Mings in turn were overthrown in 1644 by invaders from the north, the Manchus . China remained largely isolated from the rest of the world’s civilizations, closely restricting foreign activities. By the end of the 18th century only Canton (location of modern-day Hong Kong) and the Portuguese port of Macao were open to European merchants. Following the Anglo-Chinese War in 1839–1842, several ports were opened up for trading, and Hong Kong was ceded to Britain. European powers took advantage of the disastrous Sino-Japanese War of 1894–1895 to gain further trading concessions from China . The death of Empress Dowager Tzu Hsi in 1908 and the accession of the emperor Hsüan T’ung (Pu-Yi) were followed by a nationwide rebellion led by Dr. Sun Yat-sen, who overthrew the Manchus and became the first president of the Provisional Chinese Republic in 1911. On Sept 18, 1931, Japan launched an invasion of Manchuria, and installed the last Manchu emperor, Henry Pu-Yi (Hsüan T’ung), as its nominal leader. Japan’s surrender to the Western Allies in 1945 touched off civil war between the Kuomintang forces under Chiang and Communists led by Mao Zedong, who had been battling since the 1930s for control of China. The Mao regime proclaimed the People’s Republic of China on Oct. 1, 1949, with Beijing as the new capital and Zhou Enlai as premier . The Chinese economy has been undergoing radical changes and reforms shifting from a centrally planned to a socialist market economy system since 1978. These reforms include price stability, market liberalization, fiscal decentralization, creating a diversified banking system, stock markets development, increased autonomy for state enterprises, increased private sectors, and an open-door policy for the trade and investment. Most significantly, China relaxed its restraints on foreign trade once it entered to the World Trade Organization in 2001[13-16]. The Chinese Giant in Asia: China’s rising importance in Asian affairs represents a major change in regional power dynamics in the early 21st century and a major challenge for analysts of Asian affairs. China has become a manufacturing base and central destination in burgeoning intra-Asian and international trading networks producing goods, notably for export to developed countries. There also is large-scale development of Chinese infrastructure. China has emerged among the top ranks in the production of steel and other metals, cement, ships, cars, electronic goods, and textiles. It is a major consumer of international raw materials. In Asia, China is a top trader with such key neighbors as South Korea, Japan, and Taiwan, and a number of Southeast Asian countries [3,17]. Based on recent trade growth averaging double the impressive growth rate of the Chinese economy, Chinese officials have built closer political ties with neighboring countries through effective and often high-level diplomacy that is attentive to the interests of Asian governments (the Chinese diplomacy had a great role in the Sino-Sri Lankan relations). Putting aside or narrowing differences in the interest of broadening common ground, Chinese diplomacy has been welcomed by most neighbors as a contrast to the sometimes maladroit and disruptive Chinese policies of the past. Chinese leaders notably have put aside past suspicion of Asian multilateral organizations and have strongly embraced a variety of Asian groupings to the satisfaction of other regional participants. The greatest gains in Chinese regional influence have been registered in South Korea and in Southeast Asia. Elite and popular opinion in these countries has shown strong pro- China tendencies, and some government leaders have reflected this as well. China also has improved relations with India, the central Asian countries, and its relations with Russia are close. Chinese leaders want to secure their periphery in Asia and maintain stable relations in order to focus on key Chinese domestic issues involving economic growth and political stability. Needing economic growth at home, Chinese leaders endeavor to maximize effective economic interchange with neighboring countries [18-22]. China exerts influence in positive ways through mutually beneficial economic and political arrangements, featuring growing China-Asia interdependence. As Chinese leaders focus on seeking common ground with neighbors, with a few exceptions they do not seek to have neighboring governments do things they would not otherwise be inclined to do. This is consistent with their current “win-win” emphasis in developing relationships with neighboring countries . China – the economic competitor in the world: The International Monetary Fund (IMF), the most prestigious international financial institution in the world, has rated China’s ranking to number one economic superpower in the world and has asserted that China produced 17% of the world gross domestic product (GDP) in 2014 exceeding USA’s GDP of world’s 16%. China’s performance has inspired other low and middleincome countries to emulate China’s approach and engage in growth man ship including many middle-income countries of Latin America such as Brazil, Argentina, Columbia and India which also has a large population like China (Figure 2) [15, 21, 23-24]. 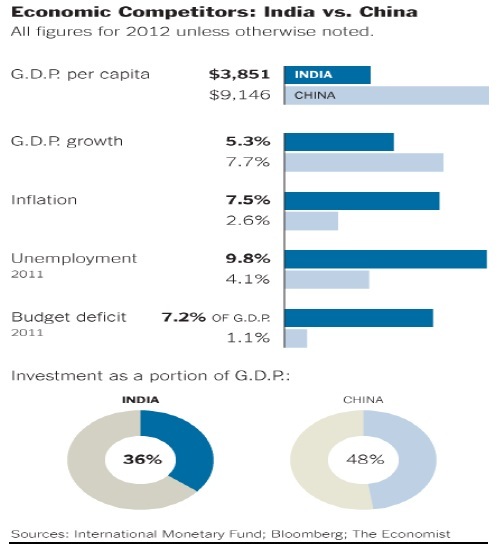 Economic competitors: India vs China . Figure 2: Economic competitors: India vs China . It is most likely that China will maintain its lead in economic ranking of GDP in the foreseeable future largely due to catch-up of its per capita income which is rising annually at 8%-10%. China’s rapid GDP growth coupled with low fertility rate (number of children per women) will boost China’s per capita income to high marginal annual growth paving the way for its convergence, in less than two decades, to the level of high income countries as estimated by USC researchers. WE have to mention that the U.S. carries a heavy military burden which does not feedback to economic growth while China has avoided heavy military burden. Instead in 2014, China inaugurated a major international economic development program by financing infrastructure projects in the historical silk route countries. It is engaged in financing economic infrastructure projects in the silk route countries with positive ROI for China and the recipient countries [23-24]. China’s political system has worked under a seven-member Politburo Standing Committee of party congress. Political leadership is elected every five years. Also, China took the decision to open to the free world and get out of the Soviet sphere of influence. It was prompted in the 1960s when President Richard M. Nixon sought close relations with China and sent his Secretary of State Henry Kissinger to China who arranged a personal visit by President Nixon with China’s leadership. The approach turned out to be very successful. It got China out of the sphere of Soviet Union’s influence, paved the way for China to open to the Western world, and the rest of the world, and eventually modify its system of political economy to a very unique system of private enterprise market economy and a oneparty political system. This unique approach has turned out to be successful both politically and economically for China, and it has benefitted the rest of the world in trade, commerce and international peace. In 2014, President Barrack Obama initiated the exchange of 100,000 American students to study in China further cementing cultural and education relations between the two countries [21,22]. Beginning in early 1980s, China shifted its economic strategy from selfsufficiency to export orientation. The shift was pivotal to the growth rate of China’s GNP. Concurrently, China is building its domestic consumer sector so that in the future it will have a strong and well-developed domestic market. The multi-billion-dollar natural gas contract with Russia in May of 2014 will be a major plus for China’s energy demand. China’s drive for the development of non-fossil fuel under its twelfth five-year plan could make it a world leader in energy exports and offer unmatchable prices on alternative energy in the world market contributing to convergence of per capita income of the silk rout countries . Since 1978, China has uplifted millions of peasants out of poverty and it has been the most successful country in the world in poverty reduction. Also, a concerted effort has been launched to bring corruption under control beginning with the effort of former president Hu Jinping and follow-up by the current president Xi Jinping. Beginning in 2012, reportedly imposing punishment occurred upon 182,000 government officials at all ranks through 2014. Several high-level party members have been removed; legal cases of anti-corruption of high officials in China have been reported in the Western press with due process. Altruism, social cognition, equity, equality, egalitarian motives, public service and economic growth are the hallmark of China’s leadership pronouncements. The duel system of one political party and free competitive market economy characterize China’s unique socioeconomic- political system . Republic of India, located in Southern Asia, bordering the Arabian Sea and the Bay of Bengal, between Burma and Pakistan. The Indian civilization or the Indus valley civilization around 2500 BC, the people inhabiting the Indus River valley were thought to be Dravidians, whose descendants later migrated to the south of India. Their culture was based on commerce and sustained by agricultural trade. The early political map of India comprised of copious independent states with fluid boundaries, with increasing population and abundance of wealth fueling disputes over these boundaries. By 600 BC, approximately sixteen dynasties ruled the north Indian plains spanning the modern-day Afghanistan to Bangladesh. Some of the most powerful of them were the dynasties ruling the kingdoms of Magadha, Kosla, Kuru and Gandhara. Mahatma Gandhi is considered an Indian symbol, during India’s freedom struggle against British Colonialism. An ardent believer in communal harmony, he dreamt of a land where all religions would be the threads to form a rich social fabric . India: the great power: India; has the potential for success in the modern world. Population with more English speakers than any country except for the United States, a strong network of elite educational institutions, a booming high tech sector and an established democracy. Four great powers (the United States, China, Japan and India) seek to play a major role in the region, and India – the most flexible of the four in terms of its options – has been able to cast itself as a kind of swing voter. The United States and Japan both want to build strategic, long term relations with India as part of a new Asian architecture that would balance a rising China. India is similarly concerned about China but understands that it benefits more by keeping a little distance between itself and its suitors in Tokyo and Washington. With China, Japan and the United States all competing for India’s friendship (and with EU nations and Russia desperate to increase trade), India has been able to enjoy the benefits of many friendships without having to make any commitments [2,6,26]. Sino-Indian race: Many have compared India’s pattern of growth to its neighbor, China. The countries have much in common—physical borders, immense populations, similar challenges, ancient civilizations, and quicklyrising economies. India also measures itself against China, coveting its economic power and international standing, including its permanent seat on the United Nations Security Council. Though a degree of tension does remain between the two nations, with lingering memories of the brief 1962 war in which China soundly defeated India, the relationship between these two Asian giants is warming up. Trade between them is now increasing at a vigorous pace, and diplomatic relations are at a post-1962 highpoint. Chinese Prime Minister Wen Jiabao, during a recent visit to New Delhi, hailed cooperation between the two nations as the driving force of a new “Asian Century.” Indian Prime Minister Singh spoke of the potential for India and China to rearrange the world order by working together . Both nations have a voracious appetite for natural resources, and a recent energy deal neatly symbolized the new Sino-Indian dynamic: India acquired a 20% share in the development of the largest onshore oil field in Iran. The venture happens to be operated, and 50% owned, by Sinopec— China’s state-run oil company. Time will tell exactly how the relationship will mix competition and cooperation. These two nations both aspire to “first-world” status—and economic gains could be the incentive for a more tightly allied Asia . India is losing the race with China: After years of rocketing growth, China’s gross domestic product per capita of $9,146 is more than twice India’s. And its economy grew by 7.7 percent in 2012, while India expanded at a 5.3 percent rate. China’s investment rate of 48 percent of G.D.P. — a key metric for development — also exceeded India’s. At 36 percent, India’s number is robust, particularly in comparison with Western countries. China has 16 subway systems to India’s 5. As China builds a superhighway to Tibet, Indian drivers battle potholed roads that they share with every manner of vehicle and live animal. India’s electrical grid is still largely government controlled, which helped contribute to a disastrous blackout that affected more than 600 million people . Despite all the reforms instituted by India since its move away from socialism in 1991, much more would have to change. Corruption, inefficiency, restrictive trade practices and labor laws must be addressed. India’s ability to govern is compromised by suffocating bureaucracy, regular armwrestling with states over prerogatives like taxation and deeply embedded property rights that make implementing China-scale development projects impossible. Unable to modernize its horribly congested cities, India’s population has remained more rural than China’s, further depressing growth. India’s rigid social structure limits intergenerational economic mobility and fosters acceptance of vast wealth disparities [2,26]. For that and for many other reasons, India will not beat China soon. China is leading, and India is always following and trying to capture China. A very good example is that of Sri Lanka, where China is establishing a good and strong economic and political relations with Sri Lanka, but India (the neighbor) will not stand looking at this Chinese policy towards Sri Lanka and is trying to open links too [7,9]. Sri Lanka, the pearl of Asia is being the destination of the huge economies, for that China took the initiative and started establishing strong economic and political relations with it bounded by agreements. In such a scenario, India that is considered the main competitor for China in the Asian region and the neighbor of Sri Lanka, will not accept this situation and this Chinese expansion that threatens it. But why the two Asian giants are interested in Sri Lanka and how they are trying to reach it . China – Sri Lanka relationship: China-Sri Lanka friendly relationship before the independence of Sri Lanka; A long-term religious and cultural exchanges and commercial and trade exchanges laid the historical foundation for the establishment and development of long-term friendly relations between China and Sri Lanka. China’s famous monk Faxian went to Sri Lanka to learn Buddhism in 5th century and a navigator of Chinese Ming Dynasty, Zheng He successively arrived in Sri Lanka for three times in 15th century, these are the two landmark events in the history of exchanges between the two countries. The independent Sri Lanka and the newborn People’s Republic of China worked together to promote sustainable development of the friendly relationship between the two countries. In January 1950, Sri Lanka acknowledged the new China. In 1952, the two sides opened a new chapter in bilateral economic and trade relationship with the signing of Sino-Lanka Rubber-Rice Pact. In 1957, the two sides formally established the diplomatic relationship [4,7]. In April 2005, when then Chinese Premier Wen Jiabao was paying a visit to Sri Lanka, the two countries announced to establish China-Sri Lanka All-round Cooperation Partnership of Sincere Mutual Support and Everlasting Friendship. In May 2013, during Sri Lanka’s President Rajapaksa’s visit to China, both sides decided to upgrade China-Sri Lanka relationship to the Strategic Cooperative Partnership of Sincere Mutual Support and Everlasting Friendship . Currently, Indian Ocean’s strategic position is rising in the world politics and global trade. Indian Ocean region has become a hot area of current international politics, especially facing the increasingly serious non-traditional security challenges, such as piracy, terrorism, organized crime and so on. Indian Ocean is becoming more and more important to the world economy and global trade because that it is becoming the important energy and trade channel to connect the Asia-Pacific region which is the center of world economic growth and the Gulf and Africa region which is the energy and resource center. Indian Ocean is one of the regions with the most intensive sea trade routes in the world, the petroleum route and trade channel in Indian Ocean are many countries’ strategic lifelines including China. As an Indian Ocean country with unique geopolitical location, Sri Lanka has a more and more important strategic status with the rise of Indian Ocean’s importance. With the improvement of port and other infrastructure, Sri Lanka’s strategic importance will rise further. The navigation safety in Indian Ocean is becoming China’s core national concern due to Indian Ocean has become the most important channel for China to import oil and resources from the Gulf and Africa. Therefore, China will pay more attention to Indian Ocean [4,5,7]. We can see the China-Sri Lankan cooperation and bilateral relationship through: the similar positions on many international issues, the two countries take economic development as a priority of their national strategy, China-Sri Lanka bilateral economic and trade cooperation has great potential especially after the upcoming signing of the Free Trade Area Agreement, and the most important thing is that China put forward the idea to create the 21 Century Maritime Silk Road to promote economic and trade cooperation and cultural exchanges in the new era . China and India battling to gain the Asian pearl: China is trying to gain Sri Lanka as a strategic country, by constructing a huge housing estate, called City Port near Colombo, Sri Lanka’s main port. The idea for construction was put forward personally, by Chinese President Xi Jinping back in 2014, who promised that China would invest $ 1.4 billion in the project. The President of Sri Lanka at the time, Mahinda Rajapaksa, readily approved the project, as Sri Lanka, devastated by the civil war (which lasted from 1983 to 2009) badly needed investment and had received it from China on more than one occasion. With China’s assistance, the reconstruction of the damaged infrastructure on the island is in full swing. The road network, railway, and a coal-fired power station have all been built. But Sri Lanka as a strategic and small country is not ready to enter in political and military alliances that may have negative effects on the country, also India the neighbor is not very satisfied in what is happening in Sri Lanka and it is going to spread its wings into the Sri Lankan land too [2,6]. The Indian leader is very concerned about the Chinese influence on the island and sees it as an economic and military threat. The island is located on the very shores of India, separated only by a narrow strait, and the Chinese presence there could create a lot of trouble. Particularly alarming for Delhi, was the fact that a Chinese submarine was docked in the port of Colombo in 2014. The Indian leadership regarded this incident with great indignation. Chinese activity in Sri Lanka was declared to be an open threat to Indian security. Thus, it is likely that we are witnessing another act of the Sino-Indian conflict but this time on the Sri Lankan land . Sri Lanka has received the largest investment in its history. The construction project is set to become an important point on the Marine Silk Road. Whether China wants to place military installations there is yet unknown, but in the abovementioned meeting in March 2015, the Chinese President announced its intention to expand cooperation with Sri Lanka in the field of defense, and the Sri Lankan President supported this idea. Both of China and India are friends of Sri Lanka, with close historical and cultural ties. Sri Lanka played a major role in the Sino-Indian relations and worked on conflict resolution between the two countries. The war had broken out in October 1962; on November 21, Zhou En-Lai declared a unilateral ceasefire providing space for diplomatic efforts. Six of the non-aligned nations — Egypt, Burma, Cambodia, Sri Lanka, Ghana and Indonesia, selected on the basis that they were all acceptable to India and China - met in Colombo on 10 December 1962. The proposals that emerged from the Colombo Conference stipulated a Chinese withdrawal of 20 km from the ceasefire line observed by China without any reciprocal withdrawal on India’s behalf. Although the mediation effort was encouraged, the failure of these six nations unequivocally to condemn China is said to have deeply disappointed India. Mrs. Bandaranaike was requested by both sides to visit both countries with the proposals. India accepted the proposals in total while China accepted them in principle as the basis to start negotiations. In the event the initiative withered on the vine [2,4-6]. The mediation effort failed to bring the warring Asian giants to the negotiating table at the time. More than four decades later the boundary issue between India and China remains unresolved, but that circumstance has not prevented the two countries from forging a flourishing bilateral relationship with a strong economic component. Today, the role of Sri Lanka is being more important in the Sino-Chinese conflict because of both countries will to cooperate with Sri Lanka. This role must be unique in the Asian region and in the world, by having a historic record in making peace between the giants and ending the disputes through Sri Lankan diplomacy and mediation. By that, the South Asian region will enter a new phase that is based on cooperation and economic development, and China will be a good example for India by sharing information and technological sciences for making their economy better [2,4-6, 27].